Sgt. Clint Dicks explains distracted driving. Sergeant Dicks is well known throughout the Columbia County Community having spent many years as a school resource officer. He also has children in the school district and his wife also works for the CCSO. Sergeant Dicks was the guest speaker. The topic: Distracted Driving. As Sergeant Dicks began his presentation he told the group, "I have three children. I have a 15 year old daughter and I'm preachin' this stuff to her, already." He continued, "If you're not payin' attention, you can hurt an entire family. Your insurance is going to go up if you have an accident." "When you're lookin' down, you're lookin' away from the road, you're mind is on somethin' else. You don't know what's gonna' happen." Sgt. Dicks explains the different kinds of distracted driving. Sgt. 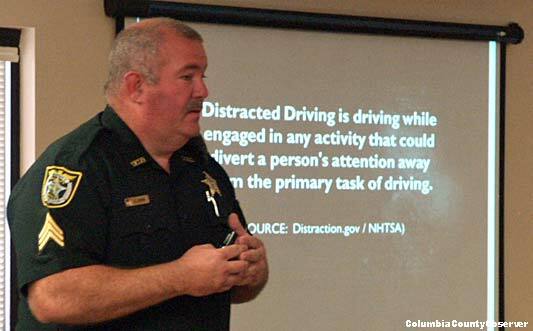 Dicks explained, "Distracted driving is doing other things while driving: cell phone texting, turning around to talk to you kids, eating, putting on makeup, shaving, talking on the phone. It is anything that diverts your attention from the primary task of driving." He continued, "I haven't come across the first person in my career that's not guilty of it. No one is immune to it.... Kids that first get their drivers license are particularly vulnerable." Sgt. Dicks explained distractions come from both inside the car and outside the car. 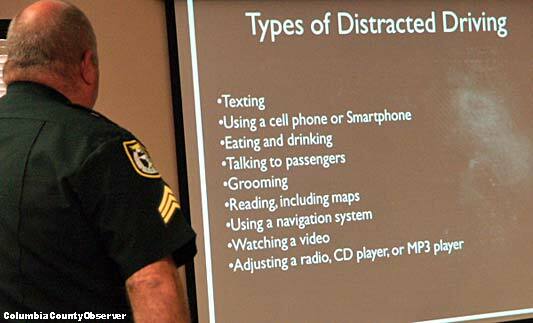 He said that anything that takes your eyes off the road or diverts one's attention is distracted driving and dangerous. "Imagine driving the length of a football field with a blindfold on." Sgt. Dicks, seated against the wall, chats with some of the attendees enjoying their free lunch before the program began. Sgt. Dicks explained that reading a text messag while driving down the road "takes your eyes off the road from 4 to 6 seconds. At 55 mph that is approximately the length of a football field." "Imagine driving the length of a football field with a blindfold on," he said. "You don't think about it until it's too late." Sgt. Dicks emphasized, "If you text while you're driving you're 20 times more likely to be involved in a crash." He asked, "How would you like to be the one that sent a text message to someone that was distracted and crashed and died as a result of receiving that text message?"